When I got into Tim Blackley’s boat for a fishing trip on Kentucky Lake, I noticed he doesn’t discriminate in his choice of electronics. 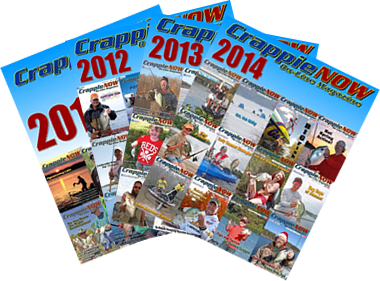 The crappie pro’s boat featured two Lowrance units on the console and Lowrance, Humminbird and Garmin units on the front deck. Blackley noted he originally equipped his boat with the Lowrance units because those were the electronics he initially used when he started fishing tournaments. “I feel comfortable with the (Lowrance) menus and I feel like I get a better image on the down scan and side scan when I am at the console, so it is my scouting tool,” Blackley said. He also has his waypoints stored in a console unit for finding marked spots and marking new spots on his electronic mapping. Blackley added the Humminbird unit to take advantage of its 360 imaging and the Garmin model for the Panoptix LiveScope technology on the front deck. The following tour of Blackley’s boat describes the electronics he uses on the console and front deck and the purposes of each unit. 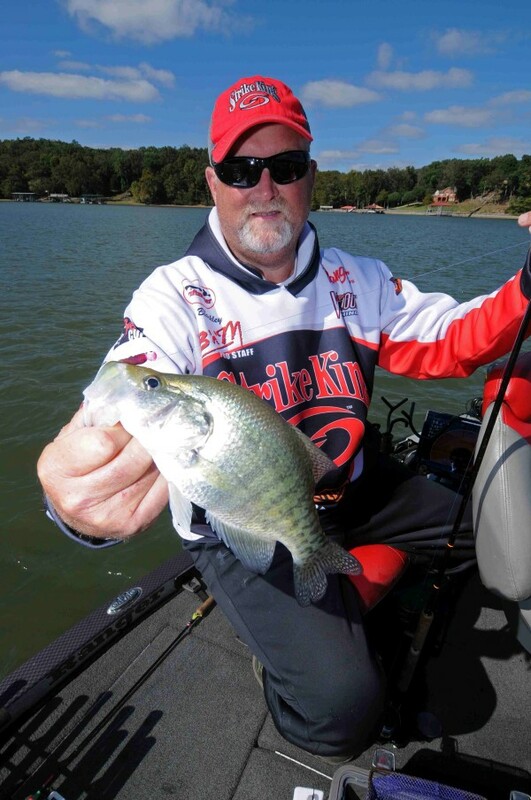 His array of electronics on the front deck of his boat gives Tim Blackley a big advantage when vertical jigging for crappie holding tight to cover. Blackley runs a Lowrance HDS-10 Gen2 model and a Lowrance HDS-12 Carbon unit on his console for scouting a general area he intends to fish. He dedicates the Gen2 model strictly to scanning right and left side imaging. The Carbon unit serves multiple purposes so Blackley usually splits its screens into mapping, down scanning and 2D sonar. When side scanning with his Gen2 unit, Blackley runs the contrast setting from 55 to 65 depending on the bottom composition. For rocky and hard bottoms Blackley sets his contrast as low as 55 but will dial it into the upper 60s for viewing mud bottoms. Blackley sets the unit’s range for side scanning at three times of the depth the unit is showing (for example, if the screen shows a depth of 20 feet, Blackley sets the side scan range at 60 feet). 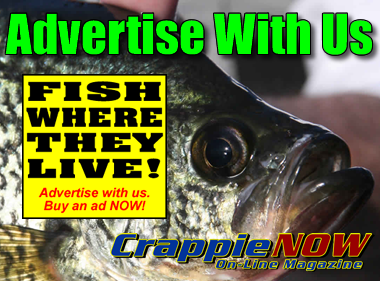 Five electronics units strategically mounted on his boat allows Tim Blackley to find crappie hot spots and stay on top of the fish. His results are good. The Tennessee pro uses the same contrast settings for down scanning with his HDS-12 Carbon unit and mainly stays with the default settings for his 2D CHIRP sonar. The screen color Blackley selects depends on what he wants to look for when viewing the side and down scans. He either opts for the amber, blue or black-and-white hues for looking at images on his screens. “Sometimes I feel like I get a better image on the blue if I am looking for cover,” he said. “Now if I am looking for suspended fish on the down scan I will run the black-and-white.” He chooses amber when viewing objects along a soft bottom and switches to blue for looking at targets on harder bottoms. Blackley varies the electronic mapping on his chart plotter feature of the HDS-12 Carbon unit from the Lowrance maps to Navionics charts depending on which map chip is best for the lake he is fishing. The front deck of Blackley’s boat consists of a conglomeration of electronics and wiring that helps him pinpoint crappie and their hideouts. 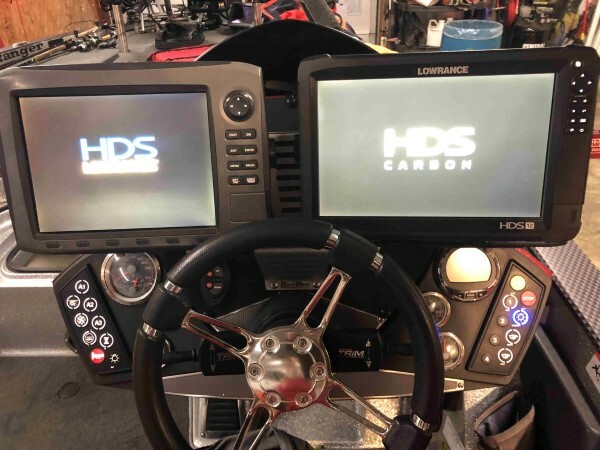 A Lowrance HDS-9 fishfinder/chartplotter is networked with his Lowrance HDS-12 Carbon unit to allow Blackley to find his GPS waypoints while scouting the area with his trolling motor. He uses this unit strictly for mapping so no transducer is hooked to the HDS-9. The tournament veteran usually relies on the factory settings for the contrast and sensitivity on his Solix unit. “I hardly ever vary that,” Blackley said. “Sometimes if I am on hard surface bottoms or muddy bottoms I will have to adjust the contrast and sensitivity to whatever the bottom contour is.” When scanning with the front view feature, Blackley sets the viewing range at 35 feet. He prefers viewing the Solix screen in the amber hue when using the front scan. 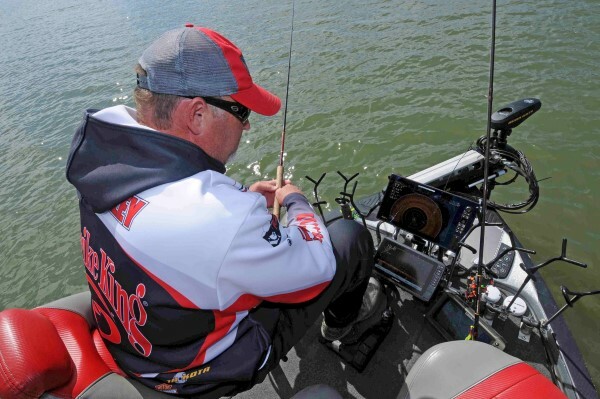 “Once I get zeroed in with the 360 and I get within 20 feet of (the cover), then I can kind of dial down with it with the Garmin Panoptix and know exactly where the fish are in the cover and I know where to position my bait,” Blackley said. Blackley keeps his Garmin unit in the factory default settings when using the Panoptix LiveScope feature, which shows a live image on his screen. “You can see every fish in a brush pile or stake bed, which way they are swimming, how deep they are and when they are coming to bite your bait,” Blackley said. 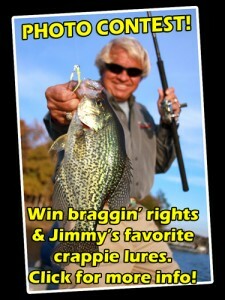 His system of electronics comes in handy when spider rigging for suspended crappie. The console units direct him to the right area while the Humminbird 360 narrows down his search and the Panoptix allows him to stay right on top of the fish. “You can see them out there swimming (with the Panoptix) and you know what depth they are and which direction you need to go to try and catch them,” Blackley said. Blackley’s array of electronics worked perfectly for us at Kentucky Lake in tough conditions with bluebird skies after the passage of a cold front. While others struggled to catch fish that day, Blackley pinpointed the cover with his console and front deck units. 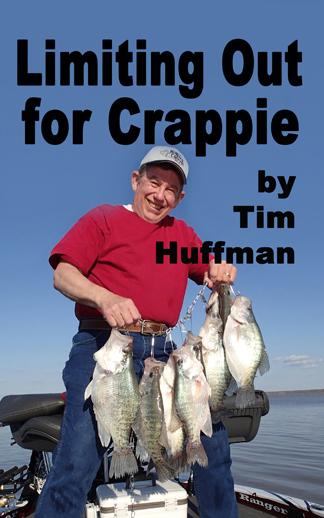 Once he dialed in the cover, we were able to catch crappie despite the unfavorable conditions by vertical jigging brush piles or stakebeds and watching the Panoptix LiveScope to see how fish reacted to our baits.